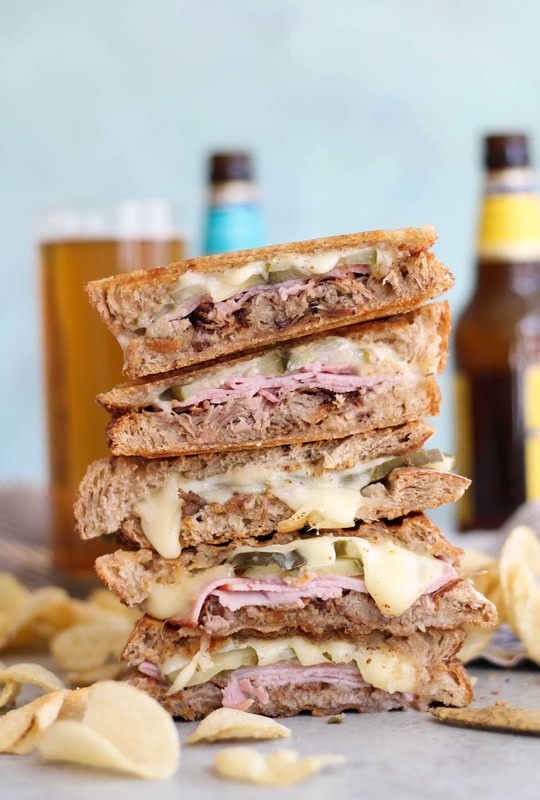 Oh, the cuban. My all-time favorite sandwich. I can’t think of a better combination sandwiched in between crusty, buttery bread. First of all, pulled pork is definitely in my top five favorite foods, and when spicy mustard, pickles, and cheese are added to the situation, it’s game over. Not to mention the bread. I know I already said it but this girl loves her bread. I really have no words for this sandwich other than you have to make it! I never make cubans at home for some reason. I always get them at restaurants. Maybe because they feel special, and kind of like a labor of love? But that is changing NOW. The pulled pork is made in the slow cooker with traditional Cuban “mojo” ingredients. Orange juice, lime juice, garlic, cumin, and oregano, and then cooked low and slow. What we’re left with is the most delicious pulled pork that I could just eat plain and be 10000% happy. But we’re making it even better. The more loaded the sandwich, the better. If you’re pressed for time, you can certainly used leftover pulled pork, but I’d highly recommend trying this method of pulled pork if you have the time. 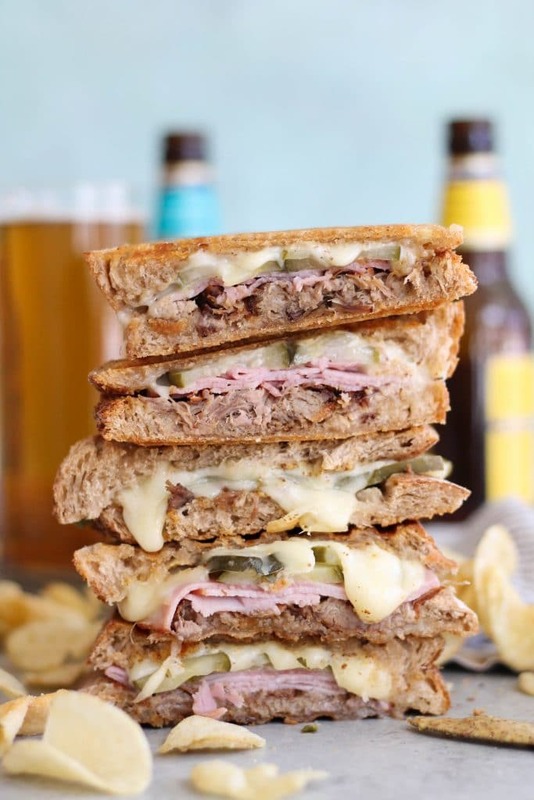 To make these sandwiches, I buttered the outsides of some super crusty bread, slathered the insides with spicy brown mustard, piled it high with the pulled pork, deli ham, the long “sandwich sliced” pickles, and swiss cheese. I then grilled it in the panini press until I had crusty, golden grill marks on the bread, and super melty cheese. I could eat these every single day and never get sick of them. Yes, these. Meaning multiple sandwiches. I could not stop. These ingredients seriously create magic together. These are so perfect for game day too! You can totally make the pork ahead of time, and grill the sandwiches as you need them. Happy weekend! I hope you love these as much as I do. 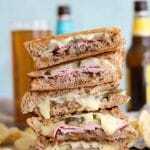 These Cuban sandwiches are made with a super simple traditional Cuban pulled pork made in the slow cooker! 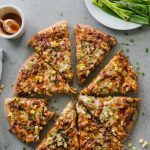 They're perfect for game day and entertaining! Make the pork. Rinse and pat dry your pork shoulder with paper towels. Place in your slow cooker and add the orange juice, lime juice, oregano, cumin, salt, and garlic. Cover and cook for 7-8 hours on low, or 4-5 hours on high. Once pork is cooked, discard any fat and/or bones, and use two forks to shred the meat. 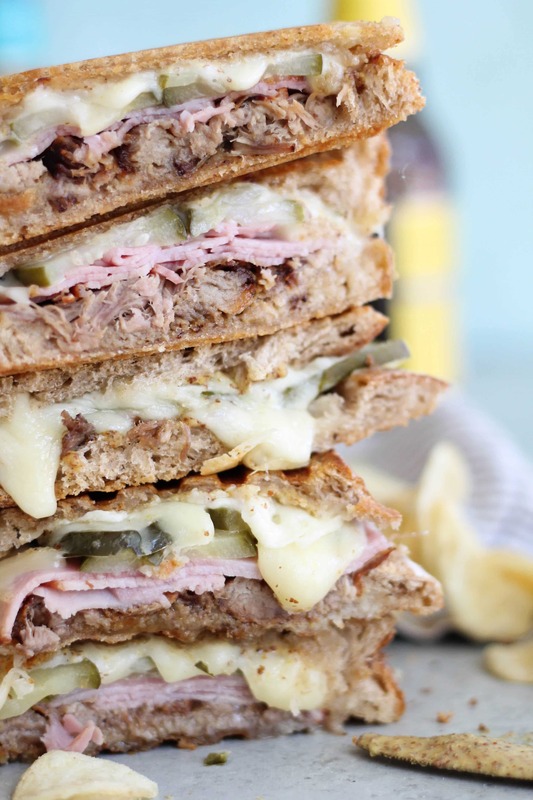 To make the sandwiches, preheat a panini press or skillet to medium-high heat. Liberally butter the outsides of the bread with the softened butter. Spread the insides of the bread with a tablespoon or two of spicy brown mustard. 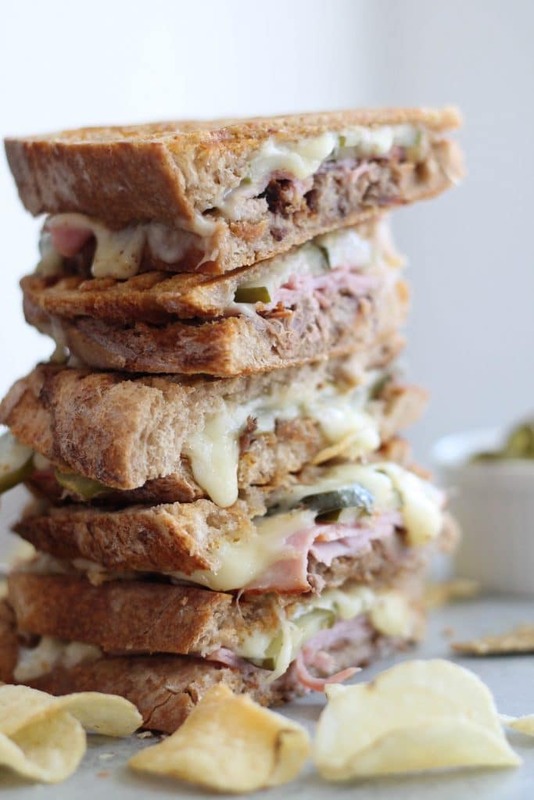 Place a pile of the pork on the bottom half of the bread, followed by a slice or two of ham, then a couple pickle slices, and a slice or two of swiss. Top with the other bread half and grill the sandwich for 5-6 minutes in the panini press, or for a few minutes on each side in a pan. You'll know it's sone when the outsides of the bread are golden and the cheese is melty. Repeat with the remaining ingredients! *You can adapt the pork portion of the recipe if you have a larger or smaller pork shoulder. Just be sure to adjust the orange/lime/garlic/spices if needed!